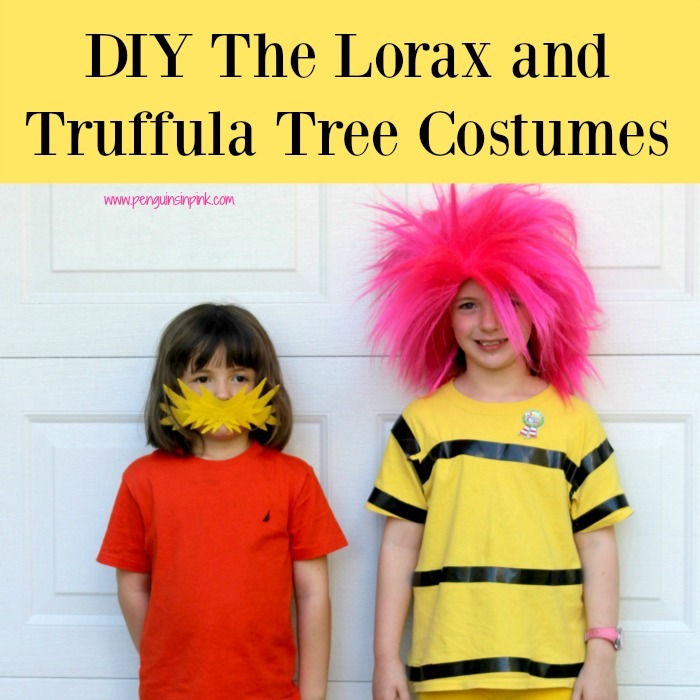 This post, DIY The Lorax and Truffula Tree Costumes, may contain affiliate links. This means if you make a purchase through one of these links, Penguins in Pink will receive a commission at no additional cost to you. 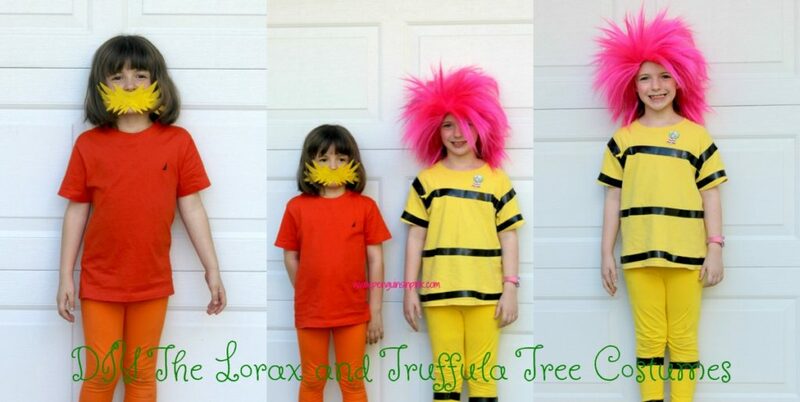 These DIY The Lorax and Truffula Tree Costumes are super cute and easy to make. The bulk of the costumes are made with t-shirts and leggings. I tried to use materials that we had at home for the costumes i.e. t-shirts and leggings. Then added a few key items to give the costumes more character. For Dr. Seuss Week both of the girls’ classes decided to dress up as characters from The Lorax. Doodles wanted to be the Lorax and Cakey was super excited to get a chance to have pink hair. 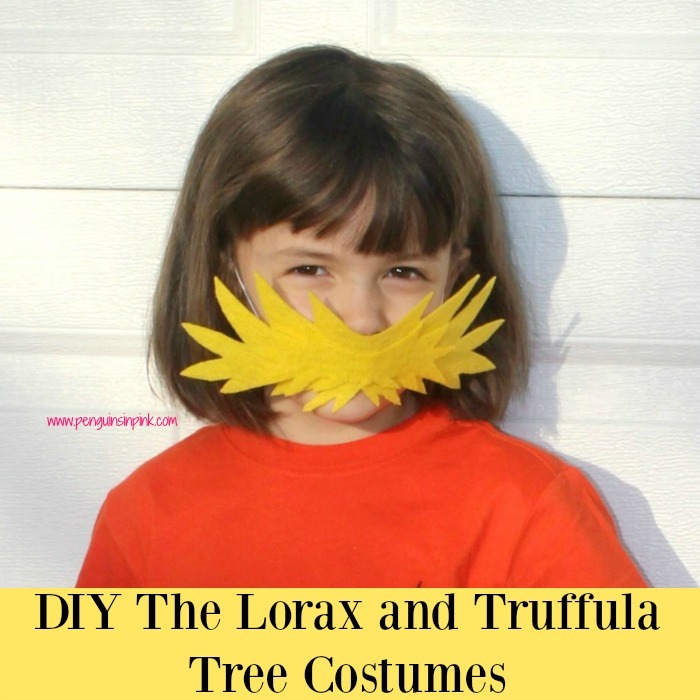 On the yellow felt draw a Lorax mustache and cut it out. Draw a second smaller mustache and cut it out. Measure around the head of the child and cut the elastic cord to size. On the larger mustache poke two holes and thread the elastic cord through. Tie elastic cord in a knot in the back. Place second smaller mustache over top of holes and elastic cord to hid them. Secure into place with hot glue. Get dressed wearing orange leggings and orange t-shirt. Slide yellow mustache over head. Cut 4-5 strips of black duct tape. Cut each strip in half length wise. Get dressed wearing yellow leggings and yellow t-shirt. Wrap strips of black duck tape loosely around the leg just above the ankle on each leg. Repeat just below the knees and again about mid thigh. Wrap a strip of black duck tape around the hem of the t-shirt. Repeat around the belly and chest. Wrap a strip of duct tape around the sleeves of the t-shirt even with the chest strip and a final strip around the cuff of the t-shirt. Pin hair up if desired and put crazy hair wig in place. 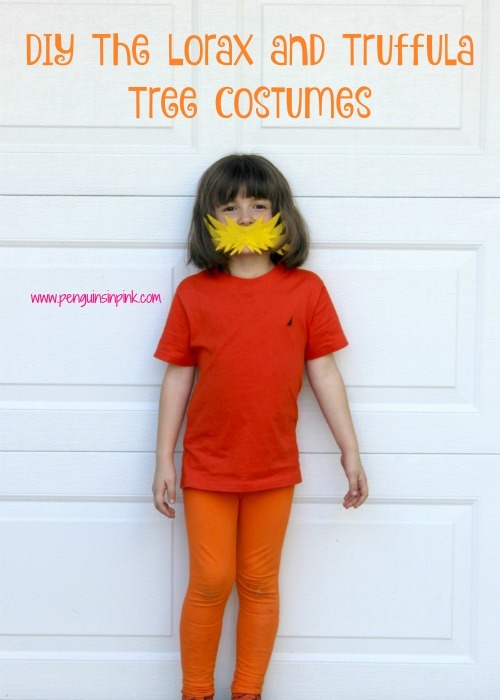 Spray hair orange or wear an orange wig for The Lorax. Wear orange socks and shoes for The Lorax. 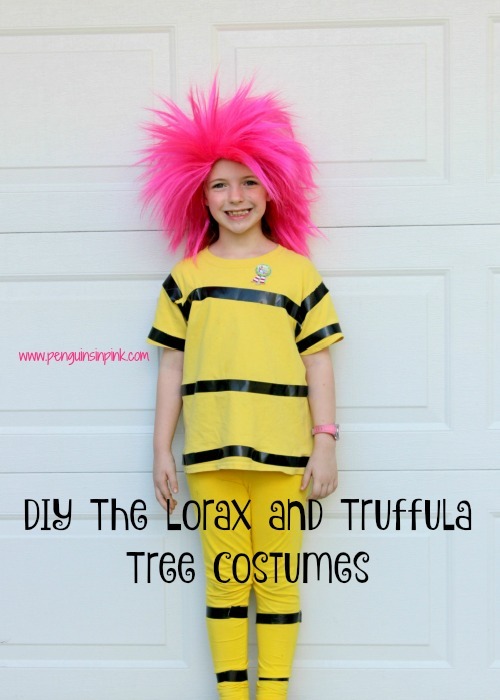 Wear yellow socks and shoes for the truffula tree. The girls loved how their costumes turned out! And I did too! 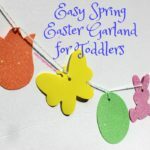 Looking for more fun Crafts? 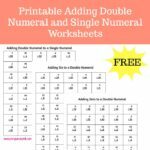 Check out my DIY & Crafts board on Pinterest.